Permanent Exhibition Closed when the temporary exhibition is closed. Closed: Mondays, Temporary Exhibition installation periods, Year-end and New Year holidays. *Free for Seniors (age 65 or over), High School Students and under 18; Persons with disability and one person accompanying each of them are admitted free or charge. Free on May 1, Coronation Day, May 18, International Museum Day and Nov. 3, Culture Day. For more detailed information, please see the following page (in Japanese). 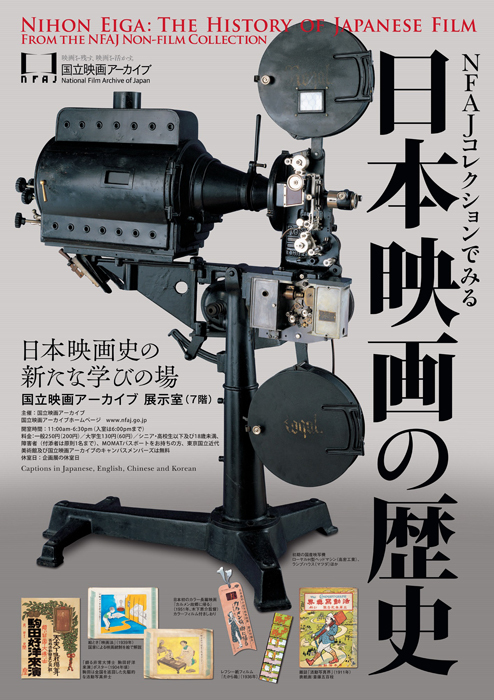 Japanese cinema has already had a history of over one century with two golden ages. Targeted towards diverse generations of viewers ranging from elementary school students to adults, this exhibition will survey the history through posters, still photographs, devices and equipments for filmmaking, and the personal items that belonged to noted film personalities, among others from the NFAJ Collection.